Spring Break In Orlando? 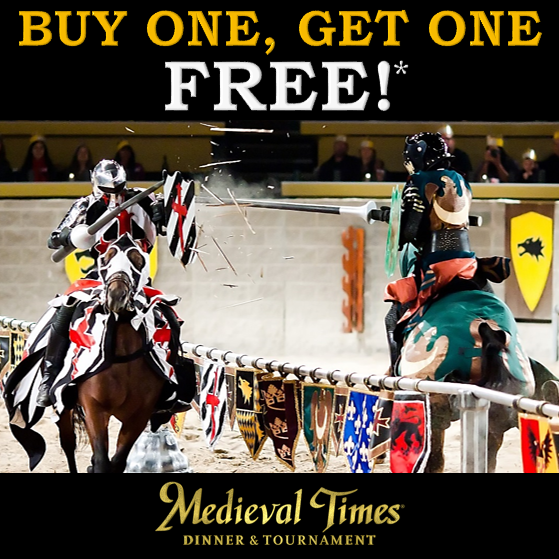 Buy One Get One FREE at Medieval Times! Spring Break in Orlando! Nothing makes kids happier and locals more terrified! Wait times at restaurants skyrocket, theme parks fill to capacity, and traffic becomes a nightmare! I have a good insight into both worlds as I use to be one of the kids who would make the voyage to Orlando for spring break and now of course as I am a local! I am constantly looking for great deals and ways to escape both the heat and the crowds! Well I have a solution for you! Our friends over at Medieval Times here in Kissimmee are giving you a great deal now until May 3rd! Between now and then, you can buy one ticket and get one free by using the code BOGORB. Buy one full-priced admission and receive the second admission of equal or lesser value FREE. Not valid with other discounts, offers or group rates. Not valid for the Sat shows at the Buena Park location. Restrictions may apply. Valid thru 5/3/15. Make your reservations by call 1-888-935-6878 or visit medievaltimes.com! If you have not seen Medieval Times here in Orlando I highly suggest it! If you click here, you can read my review of the show and see what I thought of it!!! I will say that as far as dinner shows in Orlando, Medieval Times is my favorite by far! The food is great and the entertainment is great for the entire family! Best part? It solves all your Spring Break worries! Limited seats for each show, great food on time, and air conditioned for those high heat days! Plus you get a ton of entertainment! If you do decide to go, make sure you go like an hour or so early and check out the village there as well! The village is an old style village that is part museum, part history lesson and even has cool activities for the kids! My favorite parts are both the Birds of Prey area where you can see live hawks and more and the Torture Room that has real examples of torture devices that were used in those days! So will you be taking advantage of this offer??? Comment below and let me know!!! Previous Post BAZINGA!!! Dr. Sheldon Cooper Coming to Madame Tussauds Orlando!